Apple is keenly aware that most casual photographers would love to exclusively rely on their smartphones to take pictures. With every iPhone it introduces, the camera gets a little bit better. The iPhone 7 is no exception. The iPhone 7 touts an ƒ/1.8 aperture and a six-element lens. It also comes with optical image stabilization to combat blur caused motion and handshake. The 12MP camera also captures high-resolution video up to 4K. While not limited to its camera, the new iPhones are also waterproof, which eliminates fears about shooting near water or during inclement weather. As any iPhone user can attest, the quality of photos degrades significantly in low light. The latest device promises to improve images by incorporating four smart LEDs, which makes the flash 50 percent brighter than iPhone 6s. The flash also adjusts according to the color temperature of the environment, which helps make images look more natural. To see what users have done with the phone so far, check out the iPhone 7 gallery on Flickr. The iPhone 7 Plus features even more camera upgrades. 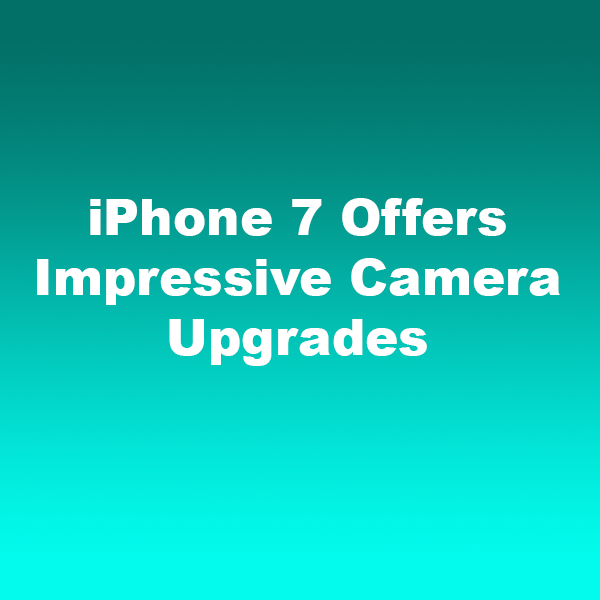 It features two camera systems — same 12MP wide-angle camera used in the standard iPhone 7 and a 12MP telephoto camera. According to Apple, the camera on the iPhone 7 Plus “actually captures two images, one with the 28mm lens and one with the 56mm lens.” Next, Apple’s software takes data from both images and then blends them together to create a single photograph. Based on early reviews, the results are impressive. Working together, the two systems will soon also be able to create the bokeh effect using a yet-to-be released feature called Portrait Mode. The ability to keep the subject sharp while creating an out-of-focus blur in the background was previously only available via DSLR cameras. For serious photographers, the iPhone will never deliver everything we are looking for. After all, Apple is hamstrung by the fact that it is trying to incorporate the features of a point and shoot camera into a much smaller device that must also function as a smartphone. But if you are already a devoted iPhone user, the latest version may be worth the upgrade.